Glastonbury In London? Whatever Next? Londonist Staff Glastonbury In London? Whatever Next? Gareth Thomas, standing to be Labour's mayoral candidate and on this basis has no bloody chance, has come up with the brilliant* idea of bidding to have Glastonbury take place in London. This got us thinking about which other events we could bring to the city while in no way destroying the very thing that makes them special. Background image by Ianvisits from the Londonist Flickr pool. Image of bulls used under Creative Commons. Why not ship the poor creatures over here to have a trot down The Mall, chasing the thousands of tourists who've come to watch the Changing of the Guard. 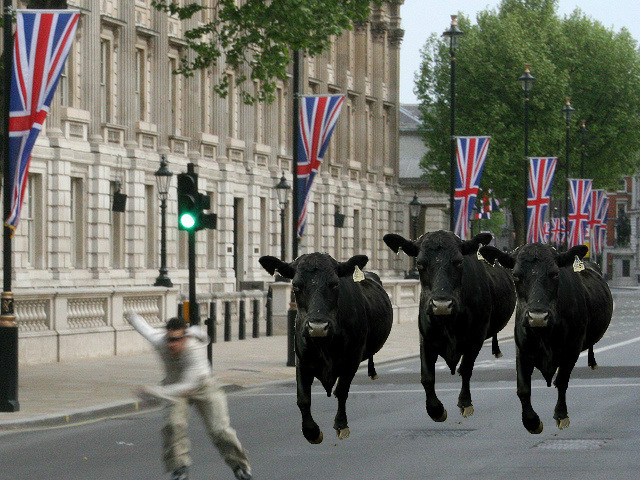 The bewildered bovines could then be slaughtered in the driveway of Buckingham Palace. There's 250,000 tonnes of sand forming a temporary beach near Brent Cross this summer. We can probably nick some more off luxury flat developments, right? We'll have off-roaders racing each other up and down the North Circular in no time. It's surely only a matter of time before mudlarking Londoners fully embrace the South Korean tradition of mud slides, mud prison, mud pools and mud skiing at the cosmetics company's messy annual festival. Sponsored by Superdrug. According to its principles, Nevada's Burning Man is an experiment in community, art, radical self-expression and radical self-reliance. There are also a lot of naked people on bicycles. Dalston's been doing this for a while. Actually, this one might just work (but would anyone notice?). Two boats. One race. 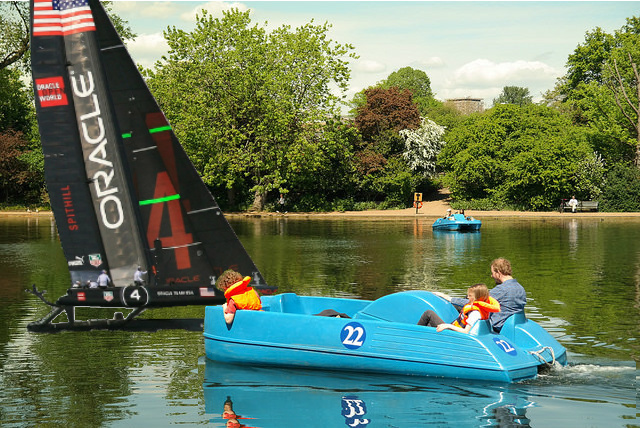 In the Serpentine. Why not? The TV coverage will be much easier to coordinate, and you don't get many ducks out in the open ocean. The contest is the poorer for it, in our view. Particularly if Boris gets his way with the water cannon idea. Or Thames Water is involved.